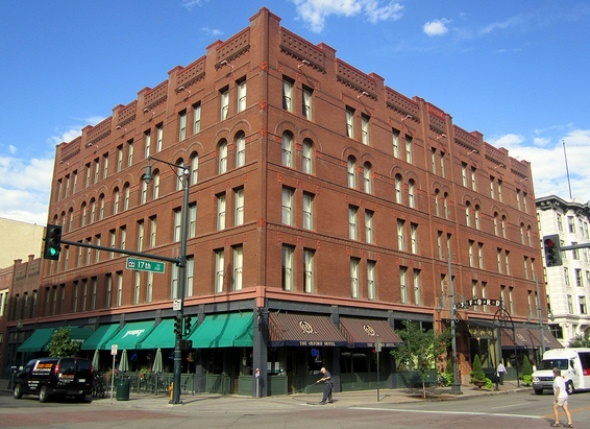 The Oxford Hotel was Denver’s first hotel, opening in 1891, and it quickly became popular because of its location a half block from Union Station at a time when train travel dominated. Today, the thoroughly renovated hotel has a prime spot in the heart of the city’s trendy Lower Downtown (LoDo) district and the renovated Union Station again serves as a regional transit hub. The 400-room hotel was built by a group led by Adolph Zang, whose Zang Brewing Co. was the largest in the Rockies. It was designed by architect Frank Edbrooke, who had supervised construction of the Tabor Grand Opera House and Tabor Block, which opened in 1880, and later would design the Brown Palace Hotel, which opened in 1892. The brick, five-story Oxford Hotel is in Romanesque style with battlements and arched windows, with a terra cotta façade. Inside, rooms were filled with oak furniture, marbled and carpeted floors, and silver chandeliers, along with natural light from a light well. Hallways were extra wide to accommodate ladies’ big hoop skirts. The Rocky Mountain News wrote at the grand opening that the hotel had the latest in gadgets and technology as well as Gilded Age opulence. The technology included a “vertical railway,” or elevator, plus a power plant, steam heating, and electric and gas lighting. The dining room set tables with Haviland china and silverware inscribed “Oxford,” and the saloon served Zang’s “Fritz Imperial” ale. Rooms were $1, or $2 for a room with a bath. A two-story brick addition on Wazee Street was added in 1903. The hotel added an annex on 17th Street in 1912 with 84 rooms on the top five floors and retail space on the ground floor. The annex was designed with an exterior of white terra cotta in Neoclassical style by the team of Robert Willison and Montana Fallis. Both the original hotel and the annex are listed on the National Register of Historic Places. As Prohibition ended in 1933, the Cruise Room bar opened just off the hotel’s lobby with a reddish, Art Deco decor modeled after a lounge on the Queen Mary. The narrow bar has booths and round stools and is known for its chrome and neon accents, wall panels depicting “cheerio” and other toasts, and free jukebox. The Oxford Hotel’s guest list has included the Clintons, the Dalai Lama, Lauren Bacall, Robert Redford, Kid Rock, Pamela Anderson and Lyle Lovett. Today, the hotel has 80 guest rooms, including a presidential suite. It boasts a collection of art from the American West that was assembled in part by artists trading paintings to pay off their hotel bills. The paintings on display in the lobby include “Sunset, Estes Park” by Charles Partridge Adams, “Mountains in Spring” by George Vander Sluis, and “Pike’s Peak” by Charles Ragland Bunnell.